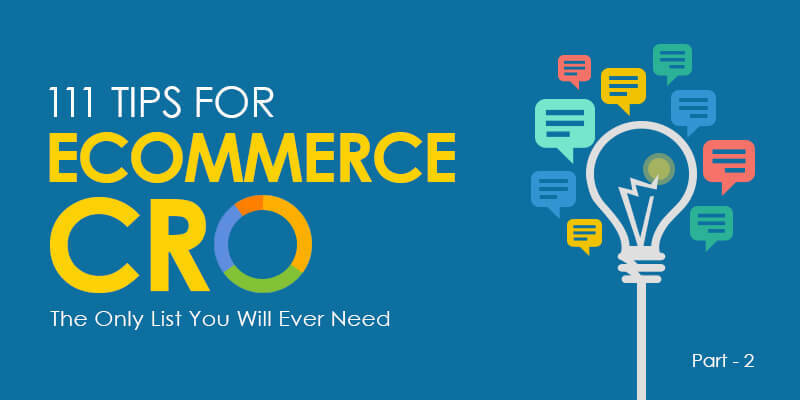 Hope you had gained some valuable take homes from our 111 Tips For eCommerce CRO (Part 1). Now, as promised, we’re back with the second part of the series to help you boost your conversion rate and the checkout/delivery process! Let’s just dive right in, shall we? When we start thinking about overall conversion rate optimization, it’s quite easy to forget about the importance of the product page. The product page is where your conversion funnel starts. Each and every element in your product page serves a particular role, when it plays its part well, you have a paying customer. If not, then you are losing your potential client to a competitor. Your product page is a great place to create the sense of urgency needed to make users convert to paying customers. To improve your revenue, it’s not only important to have an increased number of transactions, but also increased cart values. Cross selling and up selling are the two most important elements that help in increasing your cart value. Now that we have established its importance, here’s how to implement it seamlessly in your eCommerce process. The eCommerce shopping cart abandonment rate is about 68.63%, which is quite high and disappointing, considering the amount of marketing and effort you put into your eCommerce store. The checkout process is extremely delicate and by providing a seamless navigation between the checkout cart and payment page, you will have a higher conversion rate and happier customers. Shipping is make or break when it comes to eCommerce. When a customer sees the shipping charges, don’t force them into a major dilemma (Example: Do I trust this site? Does the shipping cost to much?). Having a transparent shipping and delivery process is essential for improved conversion rate. Product photography is extremely important, as it’s the only place customers can see products and decide whether they like it or not. A high quality and innovative product photography is mandatory to get customers attention. If your product image isn’t high res or useful, then don’t use it. Which would you buy? Probably #1. Both sellers want to sell a white crochet, but the seller #1 is doing a much better job in convincing customers with a dynamic and realistic photo. Your product photography doesn’t end with clicking the right picture with a high-end camera. It involves a proper setup that enhances the value of the product. The Nastygal.com case study is a great resource to understand how product photography is one of the main reasons for its success. Your customers will definitely thank you for a quality zooming functionality. It helps them take a closer look at different patterns and designs. The only drawback of eCommerce shopping is that customers can’t touch and feel the product, but giving them the ability to take a closer look helps them trust your brand a little bit more. Shoppers are extremely pessimistic. There are plenty of times they fall in love with the design and fit, but don’t buy the product because they have a problem with the color. Color is an important aspect and plays an important role in the eCommerce industry. How many times have you hunted for a particular color for products you love– Make sure you show your true colors! A product video is another great conversion tactic. It works well for customers who want to have a visual experience of the product. For any gadget, we hit up the YouTube video review before we consider buying it. Letting customers access the video, within the product page, helps makes their decision process much easier. Fitbit displays its video on the banner to help customers make quick decision about buying their product. Size guides are essential, how else can customers judge the dimension of the product and understand how well it will fit them? It’s no longer enough that you give them the numerical details, it helps to be more visual and explained in a practical manner, so customers can relate to it better and make informed decisions. The product price should be the main highlight of the page. Don’t let customers hunt for the product price, as it gives an impression that the seller is trying to hide something. It’s human psychology to trust things that are displayed prominently. Product description should be thorough and self-explanatory. They should include all the keywords the customer could potentially use to search for the particular product. This ensures your page gets indexed for the right search query and pops up for the right search. Also, it helps to get creative and craft an intelligent product description field that not only talks about the product, but also include additional elements that compliments the product. The Bose product page is an excellent example where all information related to the product is displayed through tabs. A user looking for information related to their interested product, need not look anywhere else other that the page. Don’t restrict yourself to writing boring search engine friendly product titles. You need to come out from behind your computer and look at the real world, where real customers are looking to buy products from you. We love how Asos can use the right adjectives to pep up their product titles to get customers excited. This is gets customers engaging with the brand and the product. Also, don’t worry if you can’t give a guaranteed delivery timeline like how Amazon does – Customers are satisfied with a tentative one. The reviews and ratings feature is the best way to improve your overall conversion rate. For eCommerce stores that have great products, it lets customers rave about you. So, start encouraging customers to review your products and start displaying them on the product page where your other potential customers are looking for such relevant user feedback. If you have a promotional offer, it’s better to display the “before” and “after” price of the product. This is a great conversion optimization method, letting customers visually understand how much they are saving if they opt to buy the particular product during the promotional period. It instantly gives them the necessary, “This is a great deal!” moment. We’ve all purchased products just because the see the sign says, “offer ending soon.” We have all had those moments and the same principle works well for eCommerce offers as well. Add an “exclusive product, then take advantage and put out a banners that create the sense of urgency amongst prospective buyers. Having recommend products listed on the home page, product page and even in the checkout page gets the customer’s attention, showing them other applicable products before they checkout. Listing similar products can also help customers choose products of a higher value. It also helps customers to easily navigate across products they are interested in. Products can either be listed either in similar style or based on color, depending on the nature of the eCommerce product. Style guides and tips displayed on the product page are a great up selling tactic. It helps customers pick up either complementary products or accessories along with their current product purchase. Several of the top eCommerce websites use this tactic to improve their cart value. This works well when you have a model portraying your products. The visual elements compel customers to buy the entire look and thereby multiplying the cart value tremendously. One click purchase option lets customers navigate from the product page to the checkout page, without giving them an option to abandon their cart. Even though this option is totally against our up selling and cross selling motto, it definitely works. There are quite a few customers know exactly what they want and once they find it, they would like to pay and exit. One-click checkout is the perfect option for such customers. This is another user-friendly feature for customers who like to have a constant watch on what they are buying. They find this a great tool that lets them shop within their budget. When customers add too many products, the chances of them abandoning their cart are greatly increased, as it’s even more confusing to choose between products you like. Quick view carts are a great fix for such cases. A persistent cart is another great tool that reduces cart abandonment and helps improve conversion drastically. Customers abandon their cart for multiple reasons, but when they return to the site, their cart remains intact, with all their earlier choices safe and sound. This helps user to pick up from where they left. Providing a guest checkout option is a great way to loop in new customers. Let’s face it – There are probably a million website we have already signed up and at times, we really don’t feel like signing up to another one. Guest checkout option are a great way to convert customers without getting them to sign up. The good thing about this option is that, even if they don’t come back later, we have their email ID to reach out to and get them back. You can also ask them to sign up once they complete their transaction. Obviously, a paying customer is always good for business. The checkout process is quite a tedious one and a lot of customers just want to complete the transaction and move on. Obviously, paying is simply not as fun as shopping. A predictable checkout option is a great way to let customers know exactly how many more steps to go, until they complete the payment process. This encourages them to be patient. It’s necessary that you let customers edit the size and quantity of the product during their checkout process. It makes an easy transition between the checkout and payment process. A point to be noted, only when your checkout process is 100% optimized will you be able to retain a happy customer. Whatever taxes and charges you want to add to the product, make it transparent on the product page. Customers hate unnecessary surprises at checkout, causing them to abandon their cart and never look back. With technology advancements, there are numerous paying options available to the customer. Ensure you support multiple payment types – That way, customers are not given an excuse to not to checkout. Many eCommerce owners look down upon cash on delivery, as they feel more secure about sending out their product on upfront payment. But, the reverse psychology works for the customers. They don’t like to make the payment without looking at the product first. Looking on the bright side, when the user is more confident about your product and services, they will not hesitate to pay upfront for their future purchases. During the checkout process, customers are prompted to answer lots of questions. Even though it’s essential that you get as much information as you can, certain questions are unnecessary. Some might have the patience to fill all a long form, but hundreds more don’t. If you think you need all the fields, make the least important ones non-mandatory. Your customers will thank you for this as this adds to an easier checkout process and less cart abandonment rate. This is one of the most thoughtful gesture you can do for your customer. To us, all the forms in the world should do this. Don’t add any promotions or CTAs on the checkout page. It easily distract customers from the checkout process. Keep the navigation from the cart to the payment gateway quick and predictive. For regular customers, have an option to save their card detail so they just have to enter the security key to continue transaction. Pop-ups during check out are a real deal-killer. Imagine the customer is all set to complete their payment process, when something pops up and they are forced to do something other than buy. If you feel you need some information from user or tell them about the latest promotional offer, do it with a follow up email. It’s much more efficient and adds for a better CRO. Having a secured payment gateway is mandatory. First time customers are quite nervous about doing completing a transaction with an unknown eCommerce website. These trust badges plays a major role in letting them know that you are trust-worth and deliver the products promptly. Customers become your customers once they make their first transaction. From the time when they place the first order and until they receive the product, customers are quite nervous. By having a transparent shipping and delivery process, you ease they worries and also enhance the trust they have on you. It’s the best way you can build a long-lasting relationship with your customers. It’s essential you send an email once a customer has placed an order with you. It’s mandatory you automate this process, so customers are immediately know the order number and the expected delivery date. You might not be able to give the correct delivery date and time once the user places an order. But, once you have packed and shipped out the order, it’s quite easy to give an accurate timeline. It’s advisable you shoot out an email once the order is shipped out so customers are aware about what’s happening about the order and they also know exactly when to expect its delivery. It might seem like a pain to implement this process, but it’s a great way to get customers back to your website. Customers are always eager to know what’s happening with their shipment. By giving them a way to track it on your website, rest assured they will be on your website the very next minute. Customers are busy individuals and giving them an option to select their delivery time lets them know you care about their schedule. It’s a big bonus point for eCommerce websites that are looking to build long-lasting relationships with their customers. Delay in delivery? It’s perfectly fine, as long as you tell your customers in advance. Just have one of your customer support persons call the customer and apologize for the inconvenience. Don’t let them find about the delay in delivery on their own – You’ll never hear from them again!! Customers are quite receptive to follows up review surveys and feedbacks. Make use of them and insist on follow up reviews to build up your site’s credibility. You’ll also learn a lot about how your customer perceives your website, service and products. Hope you have learned some valuable ways you can improve your eCommerce process and conversion rate! These are simple hacks that help you reach out to your customers easily and build loyalty and credibility.